In January 2018, I challenged our church body to make 1,000 Gospel conversations over the calendar year. Yesterday, December 30, we placed the 1,000th sticker on our Gospel conversation board. How did we do it? 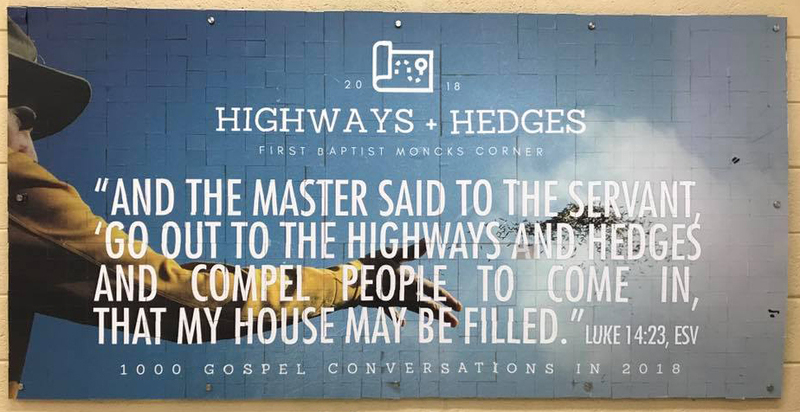 On Sunday, January 7 I started a 4-week sermon series introducing the concept called “Highways and Hedges.” I preached from Luke 14 and shared the vision. The next week we presented the GC board and explained how it worked. We defined a lost person as a non-church member who you were not sure knew Jesus. This could be a stranger, or someone you knew had never professed Christ as Lord and Savior. We gave people the opportunity to write the person’s name on the board before covering it up with a sticker. We are blessed with a worship pastor who came up with an incredible design for our board. That really helped! I explained a conversation could be sharing your testimony, telling someone about Jesus and His work, passing out a Bible, passing out tracts, sharing online via social media, etc. We wrote and published our own tracts. These tracts are very clear about the Gospel, are not corny well-designed, and gives a chance to respond and directs the recipient back to our church. All these methods get the Gospel in a person’s ears or in their hands; therefore we counted them as a GC. Establishing and reveling the vision is the easy part. Keeping the vision alive over 12 months is more difficult. Their website is filled with 60-second videos posted by all types of Christians sharing details about a recent Gospel conversation. We shared one video every Sunday for the first six months of 2018. By July we started sharing one every other week. We shared this right before the sermon so I could comment on the video and continue to point out how our people could model what they just saw. Senior adult ladies pass out tracts to people they came across in everyday life. 10-15 men who are Gideons who regularly pass out Bibles to people and are required by the Gideon ministry to share the Gospel while doing. Two mission trips led by our Student ministries as well as multiple community block parties where the Gospel was shared. Our church Operation Christmas Child team which passed out 200 Bibles at a community fair. Each recipient was told about Jesus. We counted many from Vacation Bible School - especially those children we knew were not church members. I knew that the majority would come from those sources. However, I was prepared to lead a community “blitz” later in the year if we looked like we were going to run short. We didn’t have to do that. One of the most unexpected aspects I encountered was the reticence of some of our people in putting stickers on the GC wall. Many would tell me stories of the conversations they had, but they felt “weird” placing a sticker on the wall, so I had to lead them to understand it was okay to do that. Our church runs about 300 in worship attendance every week. I explained early on that if every person who attended made just THREE Gospel conversations over the entire year, we’d come close to meeting our goal. When I broke it down that way, the goal seemed very tangible and do-able. Celebrate achieving the goal and take a few weeks to pray about what to do the next year. You can introduce your goal in mid-January and still have plenty of time to make it happen.